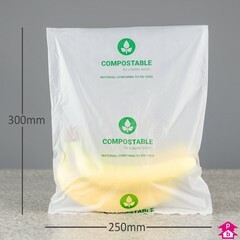 Compostable packing bags suitable for packing fruit, vegetables and other fresh produce. 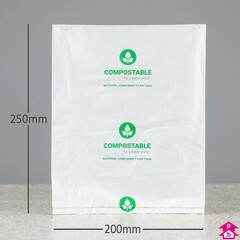 The bags are milky-white, with a repeating green print with a compostable logo and the words 'COMPOSTABLE for a better world', with 'MATERIAL CONFORMS TO EN 13432' beneath. 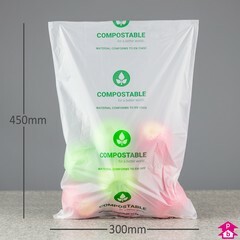 The compostable material is thermoplastic and plasticiser-free, and is made from natural potato-starch and other biologically sourced polymers. 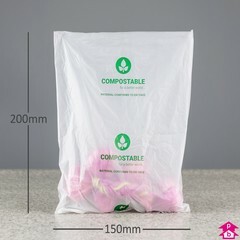 100% biodegradable and compostable in accordance with EN 13432. Bags can be heat-sealed with a standard heatsealer. Biobased carbon-share of the entire formulation exceeds 30% (in accordance with ASTM D6866). Certified "OK Compost HOME" by Vincotte. Designed to disintegrate in industrial compost units in less than 90 days. Suitable for domestic composting (disintegration time will vary, but normally taking longer than 90 days). 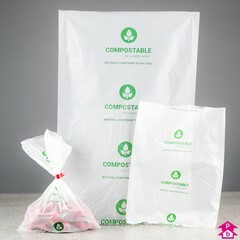 Store bags away from humidity, heat sources and direct sunlight; use within 6 months of delivery.